The national president of the National People’s Party (NPP), Conrad K Sangma, on Saturday campaigned in the interior areas of West Garo Hills to garner support of voters for former Rajya Sabha MP Thomas A Sangma, who is contesting the upcoming polls from North Tura constituency in Meghalaya. 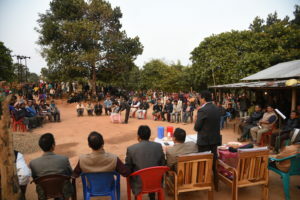 Conrad, while addressing a series of meetings in different villages of Babadam area along with party candidate Thomas A Sangma, attempted to understand the problems of the areas under the North Tura constituency and assured the voters that if they pledge their support for the NPP candidate, the party would work for the development of the area. The NPP leader, who is also the Tura Lok Sabha MP, said that the people in Garo Hills vote on the basis of ‘wave’ and told the gathering about NPP’s growing presence in both Khasi and Jaintia Hills. He attributed that the wave of NPP was very strong for which many of the “senior Congress leaders are not contesting the upcoming Assembly polls”. Conrad further said that during the past one week, he has campaigned in plain belt areas of Selsella and Rajabala constituency, wherein the voters have expressed their confidence in their party. While lashing out at the Mukul Sangma-led Meghalaya government, he ridiculed the State government for a number of inaugurations including establishment of new police stations and block development offices. “The government has not increased the manpower and there is no new infrastructure to facilitate functioning of such offices,” said Conrad, while questioning sincerity of the government to initiate development in the State. “The last-minute inaugurations and foundation laying ceremonies are nothing but an attempt to lure the public,” claimed the NPP chief. Criticise the Congress for branding NPP and BJP as a party working against the minorities, he said, “I am a Christian and our party will never remain silent if there is an attempt by anybody to hurt the sentiments of the minorities”. He also urged the people to understand and realise that NPP, as party, will work to protect the interest of the indigenous people. “For the development in Garo Hills and Meghalaya, if we have to partner with other political parties for the greater interest we will have to do,” Conrad said. Conrad also said that party candidate Thomas Sangma has shown his commitment for the people while working with the founding leader of NPP late Purno Agitok Sangma for three-long decades. “Our late leader knew that he (Thomas Sangma) had the potential which was the reason that he was chosen to represent Meghalaya in the Rajya Sabha,” said the Tura MP.